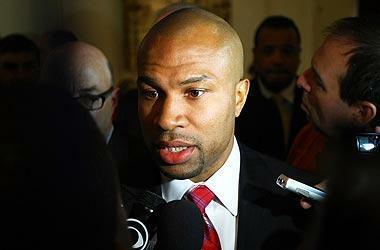 NEW YORK – The final word of the first hours of the lockout belonged to the great manipulator of the basketball masses. Once again, David Stern beat Billy Hunter on the way out the door Thursday. In his manufactured, grim disposition, the NBA's commissioner proclaimed the union had made an 11th-hour counter proposal that would call for the average salary to rise $2 million over the length of the agreement. It was a contorting of the numbers, but details don't matter in this dispute. The public's never going to side with the players, and that's been as constant a fact of a quarter-century on the job as the emperor's temper and his belief that the commissioner's chair brings the privileges of a dictatorship. This time, the owners have delivered Stern an unmistakable marching order: Break these players; crush them once and for all. The union walked into the meeting with Stern on Thursday at the Berkshire Omni Hotel on the Manhattan's eastside, and offered $600 million in givebacks over a six-year deal, a league source told Yahoo! Sports. And yet before Stern left the hotel, he had called a news conference and turned those concessions into a money grab from the players. Hunter had left the building, and left behind his chance to spin the story. So the NBA leveled the lockout at midnight on Thursday, and there's a real chance the NBA is gone for a full year now. This has the makings of the NHL's labor war of 2004-05, where the cost of instituting a hard salary cap cost the sport a complete season. The union elders don't want to give into that, nor do the agents who could be rendered far less relevant in an NBA world where there's no middle class of players. Stars will get paid, and everyone else will fight for the scraps left under a hard cap. "The key for this comes from, say, Sept. 1 to Sept. 15," says a source involved in the talks. "The owners have always been willing to blow off July and August, but once they cancel the first part of the season, that's when we find out if they have the stomach to go the distance." For now, Hunter has the support of the players, but the agents could eventually erode it. Mostly, the agents don't see a way out here. They don't see a chance for Hunter to negotiate them out of harm's way. "I honestly have no idea what our strategy is here," one prominent agent said this week. "Do we have one?" Privately, the agents will keep pushing for union decertification. They'll push for the courts, for chaos, and pray the threat will get the owners to back away from their nuclear demands. The union still hopes those less adamant over the hard cap – the Los Angeles Lakers and Miami Heat, for example – will wrest control from the hardliners, including the Phoenix Suns, Boston Celtics and Cleveland Cavaliers. The union wishes the owners would solve their competitive-balance issues with revenue sharing, but why should they? They want to make the players do it, and who's to stop them now? The players also have never been so prepared for a work stoppage, so educated on the issues, the ramifications and that's a testament to Hunter, Derek Fisher(notes) and the information age. Nevertheless, it won't matter. This isn't right or wrong. This isn't fair and unfair. These fights are always about one thing: pain tolerance. The owners believe they have more tolerance than the players, believe that pain comes with missed checks in November and December and perhaps, finally, a complete cave with time to rush a shortened 50-game regular season and playoffs. Back in the labor talks of 2005, Celtics owner Wyc Grousbeck would say over and over in the negotiating sessions: The lockout is an investment. Grousbeck smartened up, kept that thought to himself, but rest assured the mindset hasn't changed. He's one of the owners believed to be willing to lose the next season, along with Phoenix's Robert Sarver. The list goes on and on. The NBA goes away for the summer now, and nothing will get serious again until September when Stern will have to start cancelling games in the 2011-12 season. These are his marching orders, his call to arms for the owners. Stern cares deeply about his legacy, far more than most of these brash, younger owners who'd probably prefer a different commissioner anyway. They didn't hire him, and he didn't help them make fortunes owning teams like the Pollins and Davidsons did under Stern's watch. The NBA's old dictatorship is getting dictated to now, and everything changes with this lockout. There's a compromise somewhere between the extremes of the owners and players, and the burden belongs to the commissioner to sell the hardliners on reaching out and making that deal. 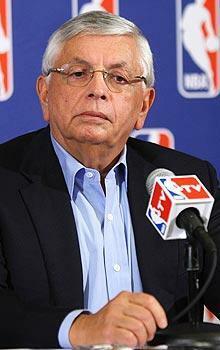 Unless Stern gets them to back down, unless the players cave come autumn, say goodbye to the NBA for a full year. And say goodbye to David Stern's legacy, which will look like that of one more star player who stayed too long in the game, who was the last to know when it all passed him by. • Is the end near for UFC favorite Tito Ortiz?